10 • ROCK products • March 2019 www.rockproducts.com IN THE KNOW The National Stone, Sand and Gravel Association (NSSGA) kicked off its annual conven- tion prior to the AGG1 show in Indianapolis. Randy Lake, presi- dent of CRH Americas Materials, addressed association members for the final time as chairman of the association. "It was an honor to serve as NSSGA chairman this past year," Lake said. "One thing that strikes me time and time again in our businesses, and across the aggregates and building materials industry, is the common thread among our people who are committed to safety, hard work, getting things done and doing a great job. I want to thank each of you for your support and participation in your association this year. You have helped to further establish NSSGA as the advocacy leader in the construction materials industry." Bob Weldon, NSSGA's incoming chairman, talked about build- ing on the successes from 2018 as he leads the association through the next year. Weldon is the president of Weldon importantly, the content was accurate, up to date and factu- ally correct." Nearly 100 FFA students converged on the show floor the final day of the show for a special #AgtoAsphalt Day to con- nect with exhibitors and learn about rewarding industry careers. The next NSSGA Annual Convention will be held in Las Vegas along with ConExpo-Con/Agg in 2020, and the next AGG1 Academy & Expo will be held March 2021 in Atlanta. 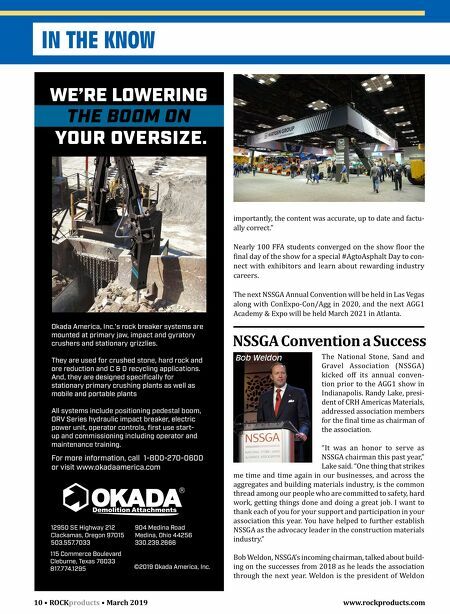 NSSGA Convention a Success Bob Weldon WE'RE LOWERING THE BOOM ON YOUR OVERSIZE. 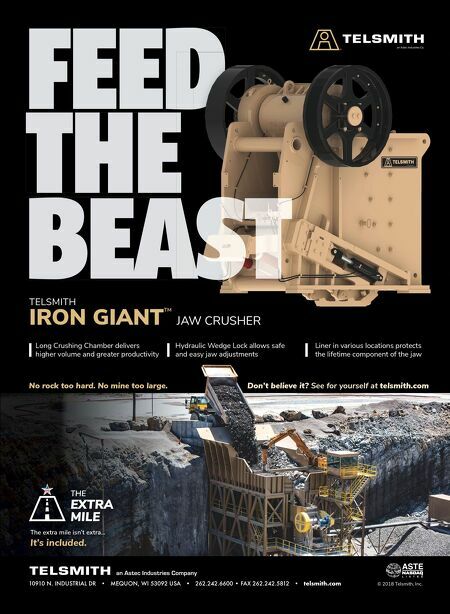 Okada America, Inc.'s rock breaker systems are mounted at primary jaw, impact and gyratory crushers and stationary grizzlies. They are used for crushed stone, hard rock and ore reduction and C & D recycling applications. And, they are designed specifically for stationary primary crushing plants as well as mobile and portable plants All systems include positioning pedestal boom, ORV Series hydraulic impact breaker, electric power unit, operator controls, first use start- up and commissioning including operator and maintenance training. For more information, call 1-800-270-0600 or visit www.okadaamerica.com 12950 SE Highway 212 Clackamas, Oregon 97015 503.557.7033 904 Medina Road Medina, Ohio 44256 330.239.2666 115 Commerce Boulevard Cleburne, Texas 76033 817.774.1295 ©2019 Okada America, Inc.